Here is an enormous Yahoo Pipe. You can see it in it’s full size by clicking here Giant Yahoo Pipe. 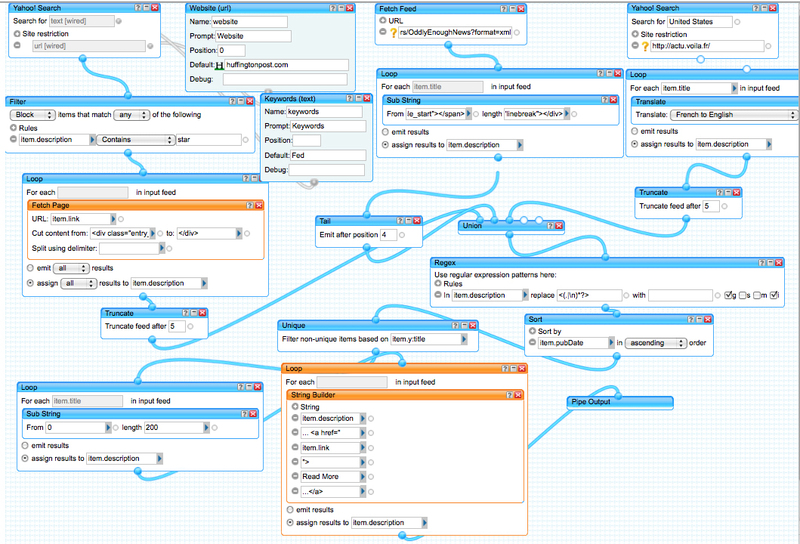 I’m going to use it to explain how to perform many different data manipulations using Yahoo Pipes. Just so you know, Yahoo Pipes is used to pull data from websites, manipulate that data, create an RSS feed with that data, and then send it where ever you would like. For more information on Yahoo Pipes see my tutorial Yahoo Pipes Tutorial. Remember you can open the full screen version of the Yahoo Pipe to follow along. Here I’m using the 2 User Input modules (URL Input & Text Input) to pass text to the Yahoo Search Module. I then am filtering those results, to only return articles that contain the word star. I pull the full article from the website and place that in the feed description. To finish it all off, I truncate the results to the top 5 results. This is what it looks like. The Yahoo Search Module takes 2 inputs. The URL you want to restrict the search to. (This is optional) It also excepts the keywords you want to search for. It will then output the results, sorted in the order of relevance to the search term. 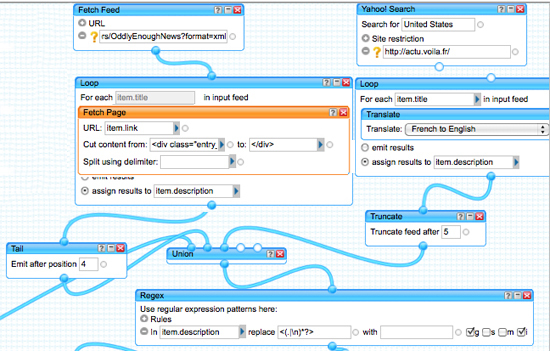 I’m allowing the Yahoo Pipe user to enter the chosen URL to search through, with the URL Input Module. You can define the order in which it is listed by typing a value into the Position field. I also chose the Huffington Post as the default URL to search. Similarly I used the User Text Input Module to enter the chosen keyword, or I used the word “Fed” as a default. I then defined that I want to block any articles in which the description contains the word “star”. I could also only permit articles with the word “star”. Searches can be further refined by adding additional rules and demanding that descriptions contain all of the words I list. You can filter based off of whether the words lie in numerous locations such as the title (item.title), description (item.description), link to original article (item.link), etc. After all of the articles are gathered I then use the Truncate Module to eliminate all of the articles except for the top 5 relevant ones. You do this with the Truncate module. Drag the Fetch Feed Module onto the screen, because I know the address for the feed. After every feed is combined into one, I send them all to the Unique Module. This module will in this case check for duplicate titles. That is probably the only option, of those available, that will eliminate duplicate articles in the feed. I use the Sort Module, to sort all of the feeds based off of publication date, in ascending order. You can sort based off of other factors, but I believe this is the most common option chosen. The Sub String Module, will trim the articles to a maximum length of 200 characters, in this example. You could choose to make the length of the description larger or smaller with it. There is a giant Yahoo Pipe that demonstrates how to use most of the modules and how they are often used. If you have any questions leave them in the comment section below. Sir, i found your tutorials very useful. I’m trying to use fetch page module to create custom RSS, but i have basic knowledge of HTML. I was able to split the page into no of contents, and then used the Rename module to copy the contents as link, title, description and pubDate as all these are available within the contents. Sir, Thanks for your great tutorial. i have a problem. i want to know how to change/remove item.link to title as this point to original feed source. 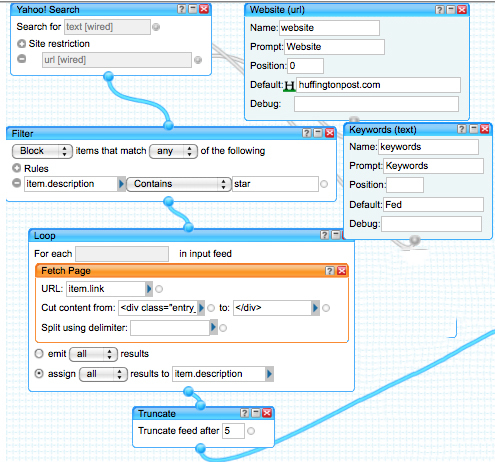 I have created a yahoo pipe, and publish this with my favorite wp plugin(feedwordpress). When i see published post, “Post title” point to orginial source of website. i want to change this with my own title. how to do this?? I am trying to use a feed, take the first 400 words of the article and translate it. To grab the full length article you need to connect to the link associated with the title in the feed. The problem with that is that Pipes seems to not like it when you do this. This will make the feed you create with pipes become unavailable from time to time. I’m looking into whether there is a solution to this issue. I’m waiting here an answer. Pals, thanks for amazing tutorial, I’m new about pipes. May you help me how to delete video from RSS feed? I have got the content but I don’t need the video. I am truly impressed by your work, wow! On my site I’m trying to insert a yahoo pipes to be able to take from this page http://www.comune.spoleto.pg.it/elenco_comunicati (which has no feeds) and extract the contents of the table on the page (using the Fetch Page module). Then, then, given that the content in the table would not have the pubDate field and therefore I would not have the ability to sort contents by date, I could use your tutorial to extract the full content of each news, divide the part description from the pubdate and create the final with the sort to pubDate. What I ask you is: Could you help me build the first part of the pipe, the one that extracts the table from the page using Fetch Page? 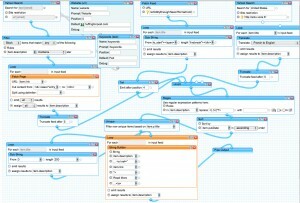 I would show you how to use Yahoo Pipes if I thought it would work consistently for you. Yahoo seems to have abandoned Pipes and nothing seems to work consistently now. I have a ton of tutorials using PHP for website scraping that I assure you will work. Just look up web site scraping and regular expressions on my site. I have finished scripts that you can download. hai…ist possible to combine 2 article from 2 feed to be one article? I’m not sure what you are looking for? Hi its a great article..
wanna asking.. how to merge 2 feed into 1, example: in 1st feed there’s a contain “iam” and then in the 2nd feed there’s contain “handsome” , how can u put it together into 1 feed with contain “iam handsome” ?? any advice please mail me? I mean the link behind the “Read More” is not working. I followed you string builder module but mine is not working. Hi, I have created a very simple pipe to pull in a feed from twitter. When I run pipe it publishes the result as a URL and then again below it as text, so it’s duplicated. I only want it as a text so I can re tweet it. For an example go to Yahoo Pipes. to Pipe output and run pipe to see what I mean. I agree with remy etienne the link does not work, if your works give us the link of the pipe please. I’m trying to solve this problem for a long time.